Hand-Tied Extensions and Natural Beaded Extensions are HERE!!! We are so excited to bringing in this new extension method to our salon!! We’ve posted some before and after from our brand below! 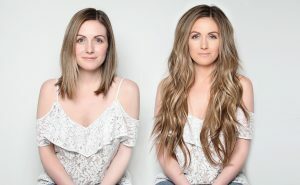 This hand tied extensions method is the newest trend in the hair industry and it is here to stay because its such a great method. There are minimal points of contact to the hair with hand tied extensions, therefore there is no damage when they are applied and cared for properly. They add a lot of fullness as well, giving you the most natural look possible. We are excited to be booking this method for early November 2018. Heather and Adelle are the stylists for your new applications. Click below to fill out the application to be a new guest or visit our Reservations page! After the application is completed we will give you a call to give you the next steps in moving closer to your dream hair!